Courtesy of Anthony Cody Phyllis Bush, seated, accepts congratulations after the Network for Public Education announced a grassroots activism award in her honor during its national conference in Indianapolis in October. Wife Donna Roof is at right; grandson Aiden Bush and son David Bush are at left. They were there when education historian DianeRavitch delivered an Omnibus Lecture at IPFW in 2012, and Bush's passion caught the attention of the former assistant secretary of education in the George H.W. Bush administration. Ravitch and California educator Anthony Cody were in the process of starting the nationwide Network for Public Education at the time, and they invited Bush to become a founding board member. 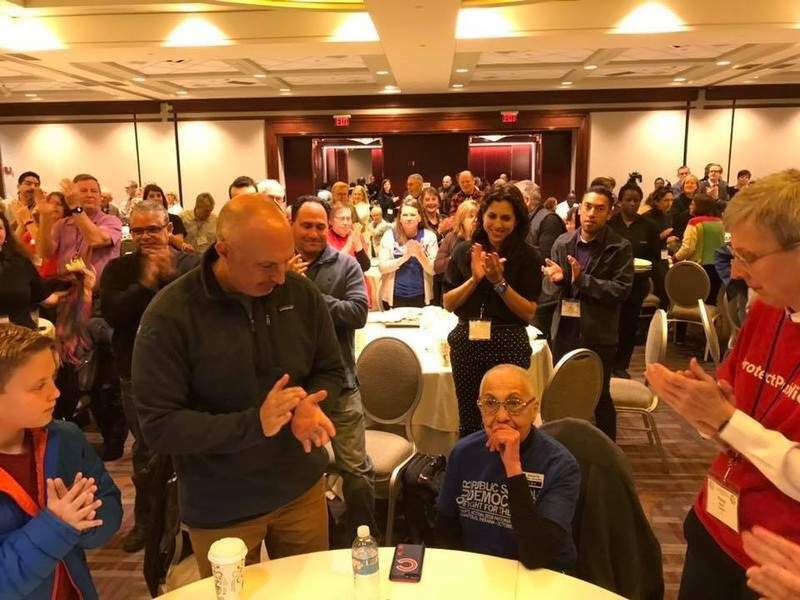 When the organization held its national conference in Indianapolis last October, her fellow board members surprised Phyllis by naming a new grassroots activism award in her honor. Save Our Schools Arizona was the inaugural winner. Its teacher-activist members won the right to challenge the legislature's voucher law in a referendum. In November, Arizonans voted 65 percent to 35 percent to reject universal vouchers. The standing ovation Phyllis received when the award was announced might have been the only time she ever was left speechless. To the end of her battle with ovarian cancer, her wry sense of humor kept family and friends laughing. But the deep sense of caring she demonstrated was what drew her friends near and kept them close. Nowhere was that better illustrated than in the response of a group of former students who jumped forward when Phyllis and her longtime partner Donna Roof decided to marry last Dec. 11. After they contacted Judge Andrea Trevino and attorney Tim Manges – both former Bush students – about arrangements for a Courthouse wedding, the two quickly made arrangements and contacted others for a joyous celebration at a moment's notice. The same outpouring of love was evident a few days later, when the couple hosted a Christmas party. Their home overflowed with friends from all parts of their lives, including the Parkview cancer nurses who had clearly come to love Phyllis. Karen Francisco is editorial page editor for The Journal Gazette.